Dr. Darja Marolt, an Investigator at The New York Stem Cell Foundation (NYSCF) Laboratory, is lead author on a study showing that human embryonic stem cells can be used to grow bone tissue grafts for use in research and potential therapeutic application. Dr. Marolt conducted this research as a post-doctoral NYSCF –Druckenmiller Fellow at Columbia University in the laboratory of Dr. Gordana VunjakNovakovic. Dr. Marolt’s work is a significant step forward in using pluripotent stem cells to repair and replace bone tissue in patients. Bone replacement therapies are relevant in treating patients with a variety of conditions, including wounded military personnel, patients with birth defects, or patients who have suffered other traumatic injury. Since conducting this work as proof of principle at Columbia University, Dr. Marolt has continued to build upon this research as an Investigator in the NYSCF Laboratory, developing bone grafts from induced pluripotent stem (iPS) cells. iPS cells are similar to embryonic stem cells in that they can also give rise to nearly any type of cell in the body, but iPS cells are produced from adult cells and as such are individualized to each patient. By using iPS cells rather than embryonic stem cells to engineer tissue, Dr. Marolt hopes to develop personalized bone grafts that will avoid immune rejection and other implant complications. Your hair or lack of will be the direct result of the lifelong tug-of-war in between activators that wake up, and cellular inhibitors that “calm” the stem cells in each and every hair follicle on your Body. According to Dr Cheng-Ming Chuong of USC and his colleagues from Oxford University Dr Ruth Baker and Dr Philip Maini, the understanding of of “cellular automaton” model is crucial in helping describe the group behavior of hair follicles.The researchers discovered that every adult hair follicle can count only on their inherent growth-promoting signals, with out the assist of adjacent follicles within the macro-environment. In contrast to the growth promotion in Humans, the growth of rabbit and mice hair follicles will be dependent on signals from neighborly follicles. dictate if or not hair on human scalps or in animal’s fur coats will be caught up in large waves of growth known as the anagen phase, or stay within the telogen or resting phase. Under proper circumstances such as the winter season or a new physiological and/or developmental stage in an organism’s life like puberty for example, an amazing collective regeneration wave can sweep over your skin, activating all the hair stem cells in the individual follicles and even those in front of them, by the 10′s of thousands. In other life stages, some individual hair follicles might even stay locked into the telogen stage by the inhibitors in their own macro-environment. The Inhibitor levels are carefully modulated in component by intradermal adipose tissue and also the central endocrine method. These numerous layers of manage produce a balance in between the inhibitory bone morphogenic protein or BMP. This is a signal that keeps hair stem cells in a calm quiescent state and later activating then with signals that wake them up. The groundbreaking new information introduces a new method to treating androgenic alopecia, probably the most common type of hair loss or alopecia in most aging males: It may be simpler to obtain hair follicles expand them once more by enhancing their surrounding atmosphere, instead of the traditional stem cell treatments for hair loss. FDA U.S. drug regulators have for the first time approved a therapy that uses cells of human blood from the placenta and the umbilical cord to treat people with blood-forming disorders or cancer. The Food and Drug Administration (USA) on Thursday (Oct 10, 2011) licensed HEMACORD, manufactured by the New York Blood Center (NYBC), a therapy that contains self-recreating cells similar to stem cells from human cord blood. This therapy is known as hematopoietic progenitor cells-cord (HPC-C) cell therapy. Those blood-forming types of cells, known as progenitor cells, are infused into patients and make their way to bone marrow, where they divide and mature. As they move into the bloodstream, they can help build new blood cells or restore their capacities, including immune function. Hemacord is approved for use in blood-restoring stem cell transplants, which can use cells from three sources: cords, bone marrow and peripheral blood, the flowing blood that circulates through the body. In 2009, the FDA guided manufacturers of such therapies to submit by Oct. 20 applications either for a license or for an approval as an investigational new drug. National Cord Blood Program is the first to get FDA’s nod, Scaradavou said. “The use of cord blood hematopoietic (blood-forming) progenitor cell therapy offers potentially life-saving treatment options,” said Dr. Karen Midthun, director of FDA’s Center for Biologics Evaluation and Research, in a statement. To further study the proliferation and multi-differentiation potentials of adipose-derived stem cells (ADSCs), the cells were isolated with improved methods and their growth curves were achieved with cck-8. Surface protein expression was analyzed by flow cytometry to characterize the cell phenotype. The multi-lineage potential of ADSCs was testified by differentiating cells with adipogenic, chondrogenic, osteogenic, and myogenic inducers. The results showed that about 5 x 10(5) stem cells could be obtained from 400 to 600 mg adipose tissue. The ADSCs can be continuously cultured in vitro for up to 1 month without passage and they have several logarithmic growth phases during the culture period. Also, the flow cytometry analysis showed that ADSCs expressed high levels of stem cell-related antigens (CD13, CD29, CD44, CD105, and CD166), while did not express hematopoiesis-related antigens CD34 and CD45, and human leukocyte antigen HLA-DR was also negative. Moreover, stem cell-related transcription factors, Nanog, Oct-4, Sox-2, and Rex-1 were positively expressed in ADSCs. The expression of alkaline phosphatase (ALP) was detected in the early osteogenic induction and the calcified nodules were observed by von Kossa staining. Intracellular lipid droplets could be observed by Oil Red staining. Differentiated cardiomyocytes were observed by connexin43 fluorescent staining. In order to obtain more stem cells, we can subculture ADSCs every 14 days instead of the normal 5 days. ADSCs still keep strong proliferation ability, maintain their phenotypes, and have stronger multi-differentiation potential after 25 passages. Each ml. of Placentrex is derived from 0.1 gm. of fresh term, sterilized, infection-free human placenta. Total Nitrogen content not more than 0.08% Preservative Benzyl Alcohol I P 1.5% w/v. DNA, RNA, Nucleotides, Amino Acids, Peptides in natural form. Placenta has been accepted as an immunologically privileged organ (graft rejection rare in pregnancy). Moreover, Polydeoxy Ribonucleotide (PDRN) present in Placental extract possesses anti-inflammatory effect. PDRN also helps release of growth factor from Platelets thus inviting Fibrinogenesis and Collagenesis. It also promotes neovascularisation and epithelialisation and thus exerts excellent wound healing properties. PDRN also possesses an immunomodulatory action. Wound healing: Bedsores, Diabetic Ulcer/Non-Healing ulcer/Varicose Ulcer, Post surgical wound repair in Caesarian sections,Hysterectomy, Oophorectomy. Placentrex provides stimulating effect on cell renewal of the epidermis on the entire body, by promoting the formation of new blood vessels, and nerves, thus leading to healthy looking skin. Skin will appear young and vibrant. 1. Physical and physic fatigue. Placentrex helps to improve a general lack of vitality, concentration, eyesight and mental weakness. 2. Placentrex helps to prevent and regulate problems associated with aging such as high blood pressure, diabetes, hypertension, cholesterol, gastric ulcers, migraine, blood circulation and arthritis. 3. Premature aging and wear of different organs brain, heart, lungs, lver, kidneys and digestive system. Placentrex promotes tissue respiration. 4. Placentrex stimulates normal growth, regenerates and accelerates repair, of aged or injured muscle, skin, collagen, bone cartilage and nerve tissue. 5. Epidermal problems, such as wrinkles, decolorization, pigmentation, eye-bags and dull skin tone. 6. Anemia. 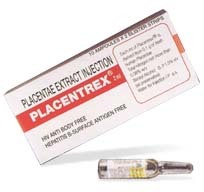 Placentrex helps normalize blood characteristics. 7. After surgery, Placentrex promotes wound healing and reduces recovery time. 8.After effects of illness, Placentrex helps replenish nutrients required by your body. 9. Menopausal syndrome, Placentrex is proven to be highly effective for women in their mid 40’s, approaching menopause. Placentrex reduces the pain and changes associated menopause. 10. Patients undergoing chemotherapy for cancer treatment. Placentrex helps to improve physical fatigue, loss of appetite and immune system.